I was the lucky recipient of Andrea's wonderful stitching and finishing skills. 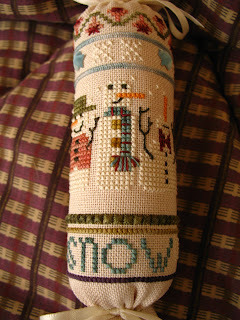 She sent me the cutest needleroll with three of the most adorable snowmen stitched on it. 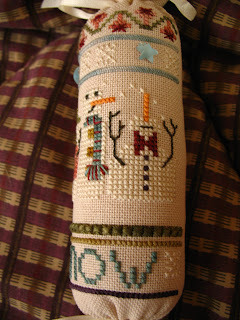 The pattern is from Winter Fobs by Heart In Hand. Here is a picture of all of the "extras" that Andrea sent. Isn't that the cutest fabric? Thanks again Andrea for a wonderful exchange. 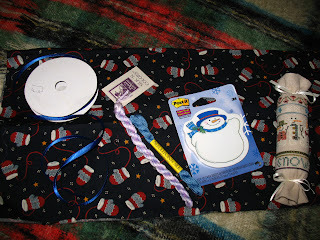 And her extras she sent is just super too...I do love those mittens on the fabric! Hurray for you Julianne!!!! A superb exchange gift and lovely extras. A real piece to treasure. It's lovely and a great exchange too! What a beautiful needleroll, and great exchange! That is a great exchange and the needleroll is so cute! Lucky you! What a fab exchange to recieve! 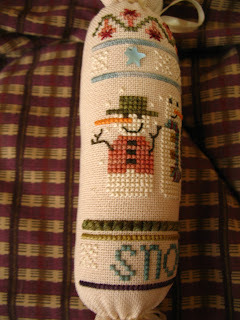 Im a snowman's friend ....i love this one too !!! !